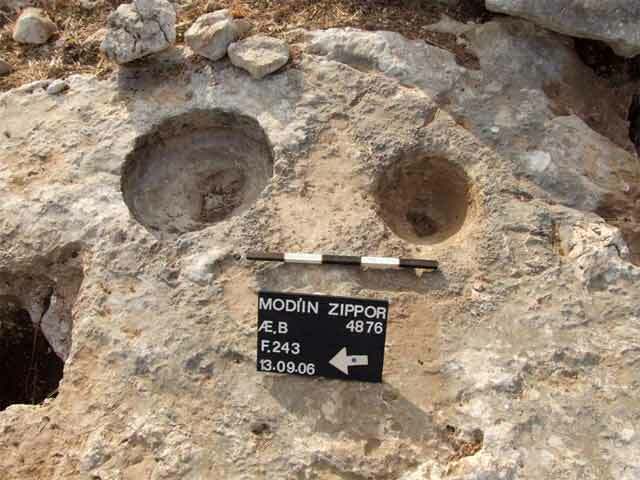 During August–September 2006, a salvage excavation was conducted in the Zippor Compound in Modi‘in (Permit No. A-4876; map ref. 200307–1695/646311–7740), prior to construction. 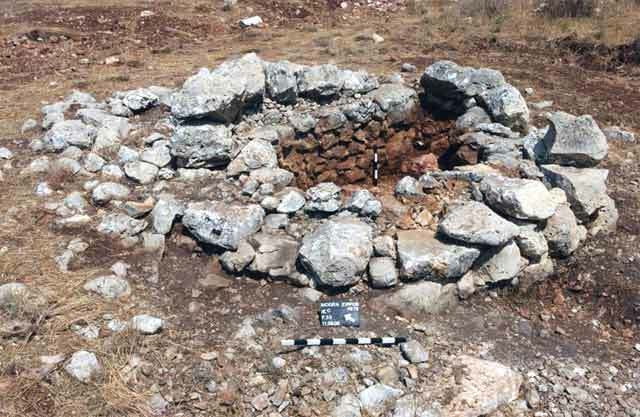 The excavation, undertaken on behalf of the Israel Antiquities Authority and underwritten by the Ministry of Construction and Housing, was directed by U. 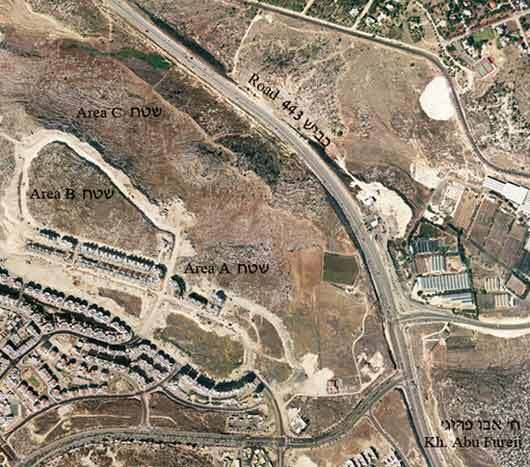 ‘Ad, with the assistance of E. Nesher, L. Talmi and R. Lupu (area supervision), S. Ya‘aqov-Jam and E. Bachar (administration), A. Hajian, T. Kornfeld and V. Pirsky (surveying and drafting), A. Dagot (GPS), T. Sagiv (field photography), the Sky View Company (aerial photography) and P. Gendelman (pottery reading). Additional aid was rendered by the inspectors of the IAA Central District. The excavation was located along the western fringes of Khirbat Abu Fureij and the northwestern fringes of Horbat Tittora (Fig. 1), in a region of mostly rocky hills with a few pockets of soil suitable for cultivation, alongside bedrock wadi terraces. 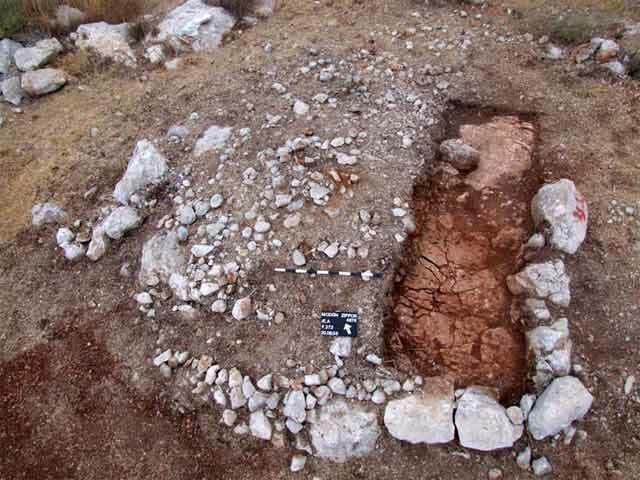 A comprehensive survey of the Zippor Compound (ESI 20:68*–69*) and various excavations that were carried out in the area (HA-ESI 112:59*–61*; HA-ESI 120; HA-ESI 122; HA-ESI 122; HA-ESI 122) have revealed agricultural installations, including winepresses, limekilns, field towers, watchman’s huts, walls separating cultivation plots, farming terraces, stone clearance heaps, dams, a cistern, cupmarks, a pit grave and a section of a road. 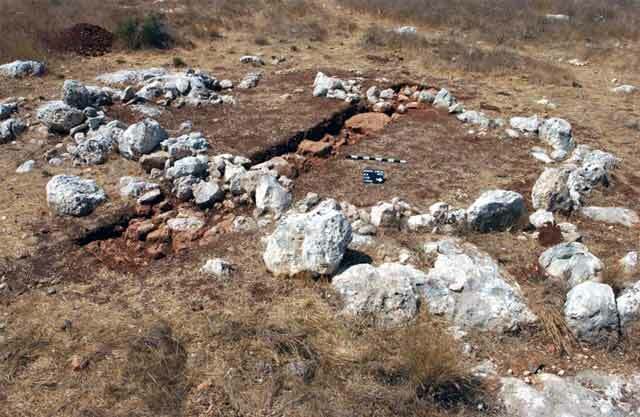 A preliminary survey of the region (I. Kornfeld and E..Nesher, aided by A. Dagot and L. Yihye) was performed and probe trenches (Y. Zelinger and E. Nesher) were dug prior to the excavation. 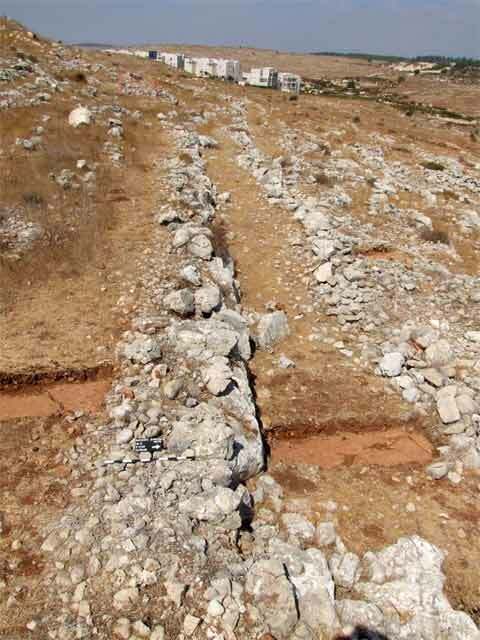 The excavation extended across two hills and a wadi to their north (Fig. 2) and was focused along the planned route of roads. 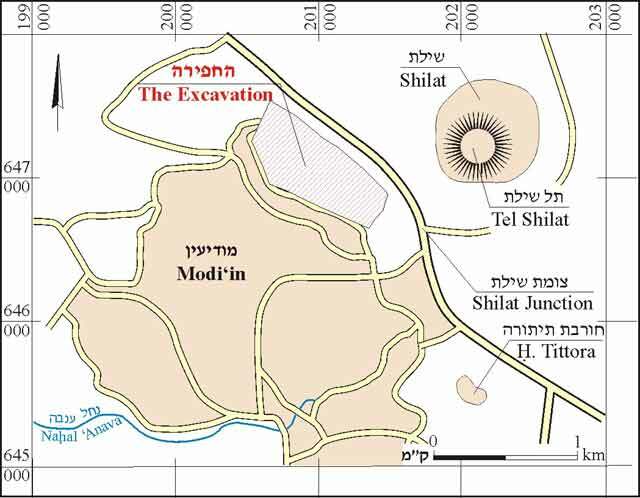 Three excavation areas were opened: Area A at the top of the eastern hill and along its northern slope; Area B on the western hill and Area C on the northern slope of the western hill, the wadi and part of the southern slope of a hill, most of which was located north of the excavation area. 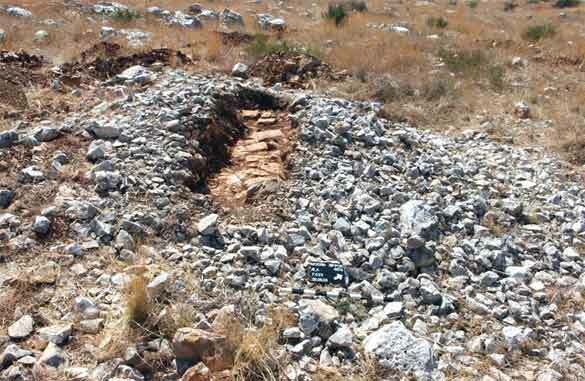 Close to 200 sites were documented and excavated, including 57 stone clearance heaps, 10 heaps of clearance stones, 33 farming terraces, eight dams that were built in the wadi for the purpose of creating farming terraces, 21 partition and enclosure walls, some 45 cupmarks of various kinds, most of which are concentrated on six bedrock surfaces, eight watchman’s huts, four road segments, three limekilns, two caves or rock shelters, three stone fences, two winepresses, two rock-cuttings whose purpose is unknown and a cistern. The activity in most of the sites dated to the first century BCE–first century CE; at the bottom of the hills and in the wadi, sites also dated to the Byzantine period. Stone Clearance Heaps. These were located alongside terrace walls or in the center of cultivation plots; most were on top of bedrock outcrops where concentrations of medium and large stones were exposed (diam. 3–7 m, max. height 1 m; Fig. 3). The stones were collected from adjacent plots, intended for planting, to clear the stones from them and facilitate their cultivation. Walls meant to delimit the heaps were exposed in some of the clearance heaps (Fig. 4). Stone Piles. Elongated stone piles (max. length dozens of meters, width 1–2 m) were formed along the farming terrace walls and natural bedrock terraces. The large quantity of stones that composed the piles reflects their vast numbers that had to be cleared away, to produce suitable areas for cultivation on the slope. Farming Terraces. Retaining walls that were built relatively haphazardly and formed leveled areas for cultivation on the slope. The exposed walls were mostly built on top of natural bedrock terraces, two to five courses high, often utilizing very large stones (max. dimensions 0.9 × 0.9 m). Fill was located next to the walls, toward the top of the slope, whose bottom part was composed of medium-sized stones with little pale red soil and the upper part was a layer of fine dark earth (thickness 0.3–0.5 m), suitable for farming. The farming terraces on the northern slopes were relatively narrowed (width 2–4 m) and those on the southern slope were somewhat wider (width 3–10 m). Dams. Walls running perpendicular to the flow of the water were exposed on the slopes of the wadi. The walls were built across the entire width of the wadi and since they were not meant to block the water, but rather to hold back the soil, they were constructed without mortar. The walls stopped the flow of the silt and thereby formed relatively leveled areas that were easily cultivated. The advantage of the areas created in the wadi over those of the farming terraces on the slopes is their large, broad territory and easy accessibility. Partition and Enclosure Walls. These walls were meant to define agricultural plots (Fig. 5) and were mostly exposed at the tops of the hills, as well as on the slopes perpendicular to the terraces. The walls are built of large fieldstones arranged in a straight line, and only rarely arranged in a curved line to bypass bedrock outcrops. Unlike the terraces, they were not meant to retain fill and therefore, they did not require strong foundations; hence they were built on top of surface soil and not on the bedrock. Cupmarks. Three types of circular cupmarks (diam. 0.1–0.4 m; Fig. 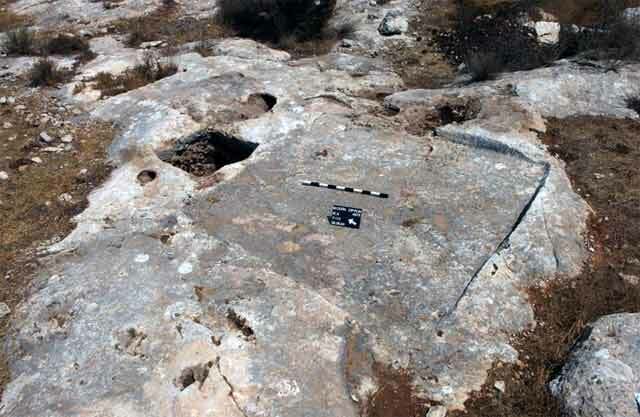 6), hewn in bedrock outcrops, were discovered. The most common are shallow cupmarks (depth 0.10–0.15 m) with a rounded bottom; the least common are deep cupmarks (max. depth 0.4 m) with a pointed bottom that renders them a conical shape. The purpose of these two types of cupmarks is unclear, as is the time when they were hewn; however, most of them were probably connected to some grinding and pounding activity, or used in extracting liquids. The third cupmark type resembles the previous two, but has a square or circular frame hewn around its aperture (Fig. 7). 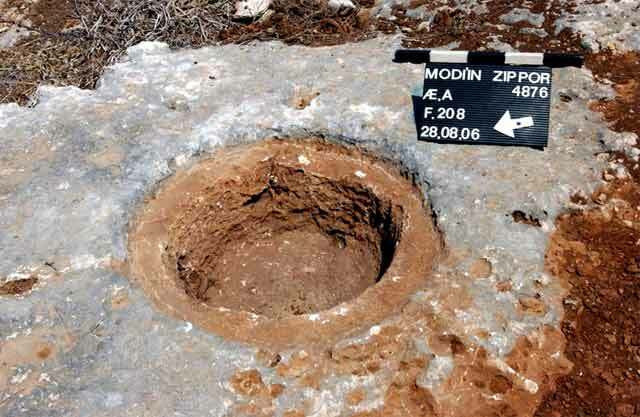 The frame was probably meant to accept a stone lid that was placed on the cupmark and it is therefore reasonable to assume that these cupmarks were intended for storing food or seeds. Watchman’s Huts. These buildings, meant for seasonal use, were constructed next to the cultivation plots in places with a commanding view over a large area. Most of the buildings consisted of one or two rooms and were either round (Fig. 8) or square. Their walls were poorly constructed of medium and large fieldstones, two to five courses high (max. height 1.3 m). Openings with large doorjambs and a step were exposed in two of the watchman’s huts. An unusual structure was discovered on the northern slope of the western hill in Area C. The architectural style of the building resembles that of the other watchman’s huts, but its dimensions are larger (10 × 15 m) and it included four or five rooms. Watchman’s huts that ceased to be used were converted to stone clearance heaps, and the walls of the huts served to contain the heaps. Roads. Three local roads (width 1.5–2.0 m; Fig. 9), delimited by bedrock terraces or low stone walls, were exposed along the northern slopes of the eastern and western hills. Occasionally, the stone walls were very wide (up to 2.5 m wide), indicating the large quantity of stones that had to be cleared to build the road. Evidence of another road along the wadi is visible; it must have been destroyed when a modern dirt road was built and a sewer pipe was installed (see Fig. 2). The roads were probably meant to link the settlements east of the excavation area with their agricultural hinterland, which was located at the tops of the hill, on the slopes and in the wadi. Limekilns. Three limekilns were exposed near the roads, where many stones for the production of lime could be found. The kilns were round pits (diam. up to 3 m, max. depth 3.7 m) hewn in the bedrock. In most instances, their upper parts, constituting less than a quarter of the walls’ height, were built of fieldstones. Cave/Rock-shelter. Caves were discovered at the top of the two hills. One (height c. 1 m) was exposed on the eastern hill. The northern part of the cave’s ceiling was missing (collapsed or dismantled) and a section of the ceiling remained in the center; a round opening (diam. c. 1 m; Fig. 10) was revealed. Based on the size of the cave and the remains found inside, it was used as a dwelling for short periods, for rest and as a hideaway. A low narrow cave was exposed on the western hill; presumably, it was used for short periods, as a hideaway for resting. Stone Fences. At the top of the western hill, in a leveled region, two large circles (diam. 8–10 m; Fig. 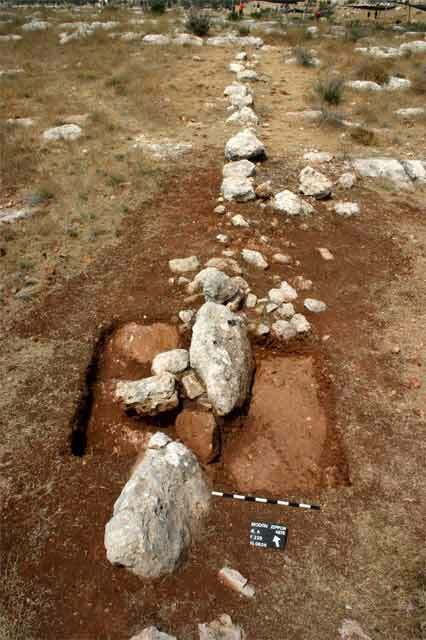 11) were exposed; these were delimited by a course of large fieldstones (max. length 1 m), with occasional spaces between them. In most instances, thorny bushes and branches were placed on top of such fences, which served to enclose animal pens. Winepresses. 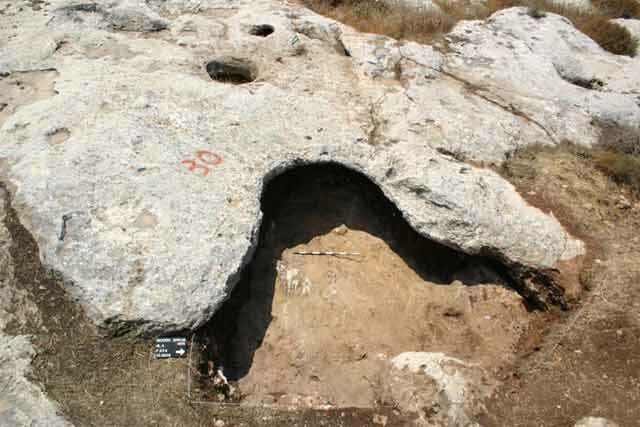 On both the eastern and western hills, a rock-hewn winepress was exposed on the upper part of the slope that faced north. Each winepress consisted of a square treading floor (c. 3.5 × 3.5 m; Fig. 12) that sloped gently to the north, toward a square collecting vat (1 × 1 m, depth c. 1 m). The winepresses indicate that grapes were grown and wine was produced in the region. The activity at most of the sites can be dated to the first century BCE–first century CE (end of the Hellenistic–beginning of the Roman periods), based on the ceramic finds recovered from the excavated sites. The activity at the bottom of the hills and in the wadi, particularly the dams and the stone clearance heaps, dated to the Byzantine period. Parts of the agricultural region, associated with one of the settlements in the vicinity of Modi‘in at the end of the Hellenistic and the beginning of the Roman periods (first century BCE–first century CE) and in the Byzantine period, were exposed in the excavation. The cultivation plots were on the slopes, in the wadis and at the tops of the hills; they were created by constructing terraces on the slopes and building dams across the wadi. Some of the plots on the slopes and at the tops of the hills were delimited by enclosure walls. Preparing the area for cultivation required great effort, since most of it was unsuitable for farming and it was necessary to build terraces and dams and clear it from stones and rocks. The stone clearance heaps and the large and numerous stone piles are a result of this activity. Some of the farm produce was processed next to the agricultural areas. For example, the winepress was used to produce wine from grapes, and the cupmarks, at least some of them, were used for processing, grinding and pounding a variety of grains. No buildings that could have been used as permanent dwellings were discovered in the excavation area and it can therefore be assumed that the agricultural areas were cultivated by the residents of one of the settlements located to the east—Khirbat Abu Fureij or Horbat Tittora, which had been surveyed in the past and villages that dated to the aforementioned periods were discovered there. 3. Stone clearance heap, looking north. 4. Stone clearance heap with enclosure walls, looking north. 5. A partition wall, looking north. 7. Cupmark with a circular frame around the opening, looking east. 8. Watchman’s hut, looking east. 9. A road running along the slope, looking west. 11. Stone fence, looking south.